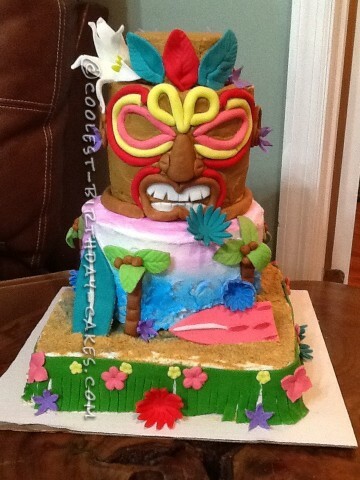 My grand daughter asked me to make her a Tiki Island birthday cake for her sixth birthday. Knowing how high her expectations are, I knew I had my work cut out. I began researching tiki pictures and themes on the internet. I chose all the perfect colors and began baking my layers. I started with two 12 inch square baking pans for the bottom layer. The second tier was made with two eight inch round baking pans. And the top tier was made with three six inch round baking pans. All my layers were made from my special pound cake recipe from scratch. When I began stacking the layers, I started with the two 12 inch layers, frosting them with butter cream frosting in between.Then I sprinkled graham cracker crumbs to make it look like a sandy beach and then rolled out green fondant to make the green grass skirt wrapping the bottom layer. Beginning the second tier, I placed wooden dowels through the bottom tier and added the second tier with a circle cardboard base for support. I frosted the second tier with buttercream frosting and patted the frosting on this tier to pull some of the frosting up creating a wave effect. Then I spray painted the frosting blue, made it look like the ocean. Next, I hand made surf boards and coconut palm trees out of fondant and stacked then against this second tier. Now for the final tier, the dreaded tiki head. I began by once again stacking the three six inch layers and frosting with brown buttercream. I rolled out red, yellow, and pink rolls of fondant to create the eyes, nose, and head decorations. I rolled out brown fondant for the ears, mouth, and nose. I cut out a white strip of fondant to make teeth. To implement something girly, I added hand made flowers on the bottom and middle layers. I also used blue flowers for earrings. The final addition was hand made white fondant Lily to place on top of the head piece. We added sparkler candles for an amazing effect. My grand daughter was amazed by this cake.